Scientists have determined that the Jomon (and Ryukyuan and Ainu) people carry a genetic marker called the ab3st haplotype or blood marker that is shared by Mongoloid populations, found today among the Korean, Tibetan, Tungus, Eskimo and Yakut peoples, and that marker is commonest among the Buryat people living around Lake Baikal. Furthermore, scientists have recently extracted the mitochondrial DNA extracted from some human bones (some of the oldest) about 2,500 years ago from the Jomon era. Their recent research showed the mitochondrial DNA of 30 Jomon bodies was close to that of the Buryat population of southern Siberia, while DNA of only three bodies was close to that of the Korean, Chinese and Taiwanese populations. This particular mitochondrial DNA pattern can also be found today in many other Japanese women, at a ratio of one out of 10 women. Experts have followed the trail of this mitochondrial DNA pattern even further back in time, and deep into Tibetan borders and Siberia. Experts now conclude that the prehistoric Japanese people and ancestors of the Jomon people originated from somewhere around Lake Baikal area in Russia (currently called Buryatia which is known to have been inhabited as long ago as 23,000 years ago). Back then during the ice ages, only small tribes of paleo-asiatic stone tool using hunters had been able to survive the harsh climate of the glacial ages up to 25,000 years by living in warm pockets along Lake Baikal and other bodies of water in Siberia, India, China, as well as in the Altai mountains. When the global climate started to warm up some of these hunters started moving south in pursuit of large animals such as mammoths, and further to Japan (while others may have crossed the Bering strait to reach the North American continent). Scientists identify these Buryat tribes from the Baikal area who migrated into Southeast Asia, southwards into the Korean peninsula and into Eurasia, the Mongoloid tribes. At a certain stage during the glacial age, the land of Paleolithic Japan was connected to the mainland at two points: Korean peninsula-Kyushu land bridge where the Tsushima strait is today, and the Tsugaru Strait between the current Hokkaido Island and the Honshu Island froze in winter, so that people from the northeastern continent were able to travel further south into Japan. The oldest evidence of this crossing is found in the Chitose Shukubai Remains with its cluster of stone tools in Hokkaido which date between 23,000 and 20,000 years ago. Based on this evidence, Palaeolithic Mongoloid hunting people must have arrived at one point in Hokkaido from Siberia via Sakhalin which used to connect Hokkaido to mainland Asia. The first Mongoloid group is thought to have made their way through a corridor North of the Tibetan massif while the second Mongoloid group took the corridor South of the Himalayas heading in southerly direction into Kyushu or southeast Asia, then into Ryukyu islands. The oldest evidence of the early colonization of southern Japan may be found in the remains of a 6-year old human child at Yamashita-cho cave (Central Ryukyu) and Minatogawa finds of 6 humans dated to around 32,000 years ago as well as human remains at the Pinzabu site dated to 26,800. Evidence of the earliest settlement on Kyushu Island, come from remains from the Ishinomoto site in Kumamoto prefectures dating to 33,720 years ago, the Ushiromuta and Kawahara sites in Miyazaki and Kumamoto prefecture dating to 29,520 and 29,370 years ago respectively, and three sites in Kagoshima prefecture, all dated to between 24,000 and 25,000 years old. On Kyushu Island, the Fukui cave remains from Nagsaki prefecture contained pottery as well as microblade lithics, dating between 14,000 and 10,700 years or so. However, one of the most important sites is thought to be the one on Shikoku Island because the remains at Kamikuroiwa Shelter showed that the area was continuously inhabited from Palaeolithic to Jomon times. From examining all of these remains, it is thought by some (Hanihara and Turner) that the Southern and Central Ryukyu was populated by people migrating from the south, perhaps Southeast Asia. But others (Omoto and Saitou) say that their study clearly shows that Ryukyan, Jomon and Ainu populations have no southeast Asian origin but are found instead to be genetically related to the populations of northeast Asia. Skull remains of the Epi-Jomon period were also intensively studied and compared with the skeletal proportions of modern-day Ainu. The studies found a close resemblance in the skeletal morphology between the prehistoric Jomon and modern Ainu. To confirm that the Ainu are actually descended from the Jomon, all available skulls of the Epi-Jomon period in Hokkaido, roughly (ca. 300 BC-700 AD), were intensively investigated for the cranial variations. Based upon the scientists’ analyses, they concluded that the Jomon, Epi-Jomon and Ainu are closely related with each other; and that the epi-Jomon were transitional stage and had evolved from the Jomon in eastern Japan to the Hokkaido Ainu. Scientists (studying blood or gene markers, and skulls and teeth) have however distinguished the past Jomon and today’s Ryukyan and Ainu populations from the populations of southern China and Pacific. The Jomon (and Ryukyuan and Ainu) people carry a genetic marker called the ab3st haplotype or blood marker that is shared by Mongoloid populations, found today among the Korean, Tibetan, Eskimo and Yakut peoples, but the marker is commonest among the Baikal Buryats living around Lake Baikal. This northern group of ab3st gene-carrying peoples can be distinguished however from a second group of southern Mongoloid peoples who were or are carriers of the afb1b3 gene, which is shared by populations in Guangxi and Yunnan area of southwest China (and who are rarely found to carry the ab3st gene). The scientists have also concluded that the gene pool of later Yayoi immigrants who had arrived 2,400 years ago had limited influence (if any) on the people of the Epi-Jomon inhabitants in Hokkaido. As such, they conclude the lineage of the epi-Jomon and Ainu people is far removed from that of the mainland Japanese and that of the northern Kyushu Yayoi people who were derived of continental lineage. Other studies (such as studies of Y chromosome SNP paternal lineages, of distributions of populations with different earwax types and of virus-carrying populations) confirm these conclusions. The earliest figurine-making tradition is thought to have originated from Upper Palaeolithic figurines from Eurasia and Siberia. The figurine developed into the mother goddess figure in the North Pacific area. Originating from the Lake Baikal area, was the ancestral mother goddess figurine figurine. That figurine probably influenced the development of the Amur River and Japanese types. In addition to the mother goddess figurines, the snake motif on pottery designs on Katsusaka pottery from the Yatsugatake mountain area, may be another indication of influence from people living in the Amur River area. Snake motifs are most widely used by all Tungus tribes in the lower Amur region where the cosmic serpent is considered the Creator of their Universe. There were possibly early connections with the Paleolithic peoples from the Korean peninsula. Remains from the earliest settlements in Kyushu showed many knife-type stone tools, which are similar to finds on the Korean Peninsula of the same age. The earliest art found in Japan were stone figurines. Archaeologists have found at the Seokjang-ri locality 1 dwelling site dating to 20,000 years ago, human hairs of Mongoloid origin with limonitic and manganese pigments near and around a hearth, as well as animal figurines such as a dog, tortoise and bear made of stone. The hairs, found with yellow-brown iron ore and manganese pigments near a hearth, were shown to have belonged to people of Mongoloid stock. The living floor of compact clay was hollowed out in the shape of a whale. Although the earliest pottery in the world is found at the Odai Yamamoto site on northern Honshu Island and on Kyushu and Shikoku island sites, many scientists and scholars think that the pottery culture may have been introduced into the Japanese archipelago via a northerly route from the Eurasian continent. Archaeologists have uncovered five sites in Amur River basin in Eastern Russia with early pottery shards as well as stone tools (lithics) that are similar to those of the Odai Yamamoto site. However, scientists also suspect that because the Amur River pottery were fairly sophisticated, the origin of this pottery production tradition could probably be traced back to an earlier time in South China. From around 10,000 BCE, some aspects of the Jomon pottery culture showed similarities with that of Jeulmun pottery in Korea. The respective pottery samples were extremely similar in shape, form and technique. Other aspects of the people who made the Jeulman pottery such as the shellmound culture indicating a shellfish diet, were similar to the Jomon culture of the time too. The connection of Jomon pottery with mainland sites in China is also evident. Sites in central and southern Japan yield a lithic industry similar to southern China with pebble-flaking, chipping, pecking and polishing as the same basic techniques. Far east in the north on the continent, and reaching far to the south was a culture with axes or round or oval section. On the other hand, shouldered-axe culture was to be found in the south and in the coastal region from Nanjing to Tongjing, Yunnan to Fujian and that reached the coasts of Korea and Japan. Jomon people were influenced by the sea since they lived surrounded by the sea on the Japanese archipelago. The sea routes would have made it possible for successive waves of migrations of human groups from the continent to enter the archipelago and come into contact with Jomon people. People probably came to live or to trade. Among the important sea routes or “sea bridges” of the Jomon, were the migratory paths from the South China coast (particularly Fujian) and Southeast Asia. In particular, the rice culture of the Yangtze people in the Hemudu period through the Liangzhu period, is thought to have been transmitted to the Japanese archipelago via the Fujian people and the Taiwan sea bridge. The influence of the culture from the Yangtze basin can be seen in the artefacts such as jade, stone, perforated axes, perforated stand vessels and others, many of which are found in the Fujian region too. From around 5,300 years till 3,600 years ago (the Early Period) the Jomon culture showed some similarities to South China coastal and Southeast Asian cultures from Fujian to Malaysia, such as in the shouldered and tooth-shaped stone axes, ornaments decorated with large spiral patterns or a mixture of cord and shell prints or eye forms, pottery with widening stands and bulged middle line, among other artefacts. Typical artefacts such as pebble axes, pointed picks, short axes, waisted axes, shouldered axes and others were unearthed at Kozanji, Kutobo, Ubayama and the southern Japanese islands, all of which were also common in South China and Indochina. Hence, some scholars think migrations from the South China coastal areas and Indochina from the Middle Period onwards were important in the formation of Jomon people and culture from the Middle period. They see, for example, close similarities between the shouldered stone axes, rectangular axes with triangular blades, round stones with deepening in the middle, as well as the phallic shaped stone hoes, found in various parts of the Jomon world from around 4,500 to 3,200 years ago and those found in Indochina. Stones circles found in eastern and northwest Japan, can also be seen on the Korean Peninsula and in southern part of Northeastern China. Dolmens and stone circles are thus thought to be a shared megalithic culture by Japan and other regions in East Asia and that the dolmen culture originated in Manchuria or on the Liaotung Peninsula (as dolmens are most numerous along the Northeast Asian geographical corridor — Liaoning, to Shandong, and Zhejiang in China). Austronesian region at least from the first millennium BC (Bellwood) and from Nias, Borneo (Heine Geldern) offers a new and unusual view in a study on Vietnamese and SEA megaliths, that the “megalith sites in Vietnam might have belonged to the megalith complex in western Pacific, spreading from Japan to Korean peninsula to all over Southeast Asia”. A separate recent mtDNA study on the Haplogroup M12 – the mitochondrial component of Japanese genes, the counterpart of Y chromosome D lineage – also confirmed the direct connections of Japanese haplotypes with Tibet. This rare haplogroup is possessed only by mainland Japanese, Koreans, and Tibetans, with the highest frequency and diversity in Tibet. These Paleolithic ancestors were thought to have migrated into Japan sometime around 20,000 years ago. Interestingly, the Y chromosome study also suggested that there could be one other Japanese Paleolithic founding that found its way to the Japanese archipelago, these early ancestors carried the Y-STR haplogroup, C-M8, a Y-chromosome haplotype that is related to Indian and central Asian C chromosomes. This set of C-M8 Y chromosomes were thought to be carried into Japan sometime around just before 12,000 years ago. The same study also concluded that Jomon genes have survived till today showing up at high frequencies in Japanese populations today (34.7%) The scientists having charted the Haplogroup D chromosome-carrying populations who were found to exist at frequencies distributed in an inverted U-shaped pattern across the archipelago, with the highest frequencies occurring in the southern Ryukyuans (Okinawa) and the northern Ainu (Hokkaido). The results suggested to scientists that not only the distinct genetic contribution of Paleolithic ancestors but that they had intermarried (admixed) with the later income Yayoi migrant populations who were of a separate and different haplotype O lineage. The strongest evidence for a southern genetic component in the Jomon is the M7 (mtDNA) haplogroup that comes from a recent research paper defining the East Asian mtDNA Tree (Toomas Kivisild). The paper notes the “characteristically southern distribution of haplogroup M7 in East Asia, whereas its daughter-groups, M7a and M7b2, speciﬁc for Japanese and Korean populations, testify to a presumably (pre-)Jomon contribution to the modern mtDNA pool of Japan”. The haplogroup M “branch of the mtDNA Tree” is regarded as unequivocally Indian-derived and of southern origin, because it is found in Eastern Eurasia but is virtually absent in Europe. Other research on mtDNA on Indian subcontinent adheres to the “Southern Coastal Route” hypothesis, as “suggested by the phylogeography of mtDNA haplogroup M, the virtual absence of which in the Near East and Southwest Asia undermines the likelihood of the initial colonization of Eurasia taking a route north around the Red Sea. 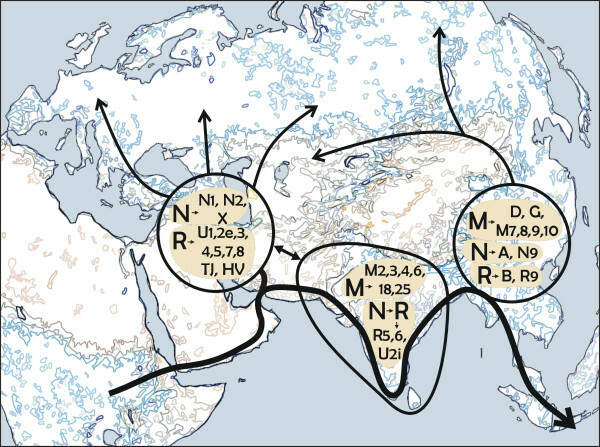 Map of Eurasia and northeastern Africa depicting the peopling of Eurasia as inferred from the extant mtDNA phylogeny”. The bold black arrow on the map above indicates the possible “coastal” route of colonization of Eurasia by anatomically modern humans (ca. 60,000 – 80,000 ybp). Therefore, the initial split between West and East Eurasian mtDNAs is postulated between the Indus Valley and Southwest Asia. Spheres depict expansion zones where, after the initial coastal peopling of the continent, local branches of the mtDNA tree (haplogroups given in the spheres) arose (ca. 40,000 – 60,000 ybp), including M7, from where they where further carried into the interior of the continent (thinner black arrows). Yali Xue et al., “Male Demography in East Asia: A North-South Contrast in Human Population Expansion Times,” Genetics 172: 2431-2439 (April 2006) The study notes that Manchu-Liaoning populations display the N1*-LLY22g haplogrpup (xN1a-M128, N1b-P43, and N1c-Tat) at 5.7% frequencies. To investigate the genetic characteristics of the ancient populations of Hokkaido, northern Japan, polymorphisms of the ABO blood group gene were analyzed for 17 Jomon/Epi-Jomon specimens and 15 Okhotsk specimens using amplified product-length polymorphism and restriction fragment length polymorphism analyses. Five ABO alleles were identified from the Jomon/ Epi-Jomon and Okhotsk people. Allele frequencies of the Jomon/Epi-Jomon and Okhotsk people were compared with those of the modern Asian, European and Oceanic populations. The genetic relationships inferred from principal component analyses indicated that both Jomon/Epi-Jomon and Okhotsk people are included in the same group as modern Asian populations. However, the genetic characteristics of these ancient populations in Hokkaido were significantly different from each other, which is in agreement with the conclusions from mitochondrial DNA and ABCC11 gene analyses that were previously reported. Thank you for spelling this out so clearly. In future, I would like to see photos of tool, skull, and pottery types. The Ainu of the Nile dispersed northward to Finland and from there to Greenland and eastern Canada. Some also went east to India, Cambodia and Japan. The Nilotic Ainu are probably “First Nation People.” They are at the center of Luigi Cavalli-Sforza’s genetic distance chart. I think it is a very big leap of logic to call the Ainu, the Ainu of the Nile. Even though it is acknowledged that they are descendants of an ancient lineage somewhat preserved by genetic drift, the term Ainu is reserved for the distinct ethnic people in Japan, and their closest relatives on Sakhalin. Also their identity is still an admixture, and their migratory lineages and genetic affinities have to be established step by step both in time and by distance. The Nile is at the extreme opposite end of the earth and the Ainu, as either earliest settlers or among the earliest settlers of Japan, go back anywhere between 10,000 to 40,000 years in time. As per the analysis by Tajima and Horai, see their “Genetic Origins of the Ainu” “On the paternal side, the vast majority (87.5%) of the Ainu exhibited the Asian-speciﬁc YAP+ lineages (Y-haplogroups D-M55* and D-M125), which were distributed only in the Japanese Archipelago”. So far, the furthest back-traceable origin we have of haplogroup D (also found in Andamanders, Tibetans, Yunnan-popns), is to the sub-haplogroup DE*, which is thought to be the most ancient lineage of the D/E* superhaplogroup and which is thus far only found in Africans from Nigeria, Guinea-Bissau … which are in West Africa rather than Cushitic E. Africa (although I do not discount the possibility that future studies may throw up new links). As for the Anu-Ainu connection, I can show you a cognate city called Ainu in Nigeria, and since 30-40,000 years is a long time ago, I don’t really too much store on the Ainu-like names, it is often written in Japanese literature that the term Ainu was a derogatory name given by the later arrivals, sounding like “inu” and meaning dog. I have read your “Abraham’s Ainu Ancestors”, but your mention of all the names from historic sources relate to a non-Ainu population and unconnected migratory lineage (their genetic sources have been proven to be totally unconnected). The Hebrew or semitic traits and influences to which you refer, have, more likely to do with the Indo-Saka and Ashina royal lineages which entered Japan late-Yayoi and Kofun periods (haplogroups O2, O3 and Q1b) from Western China and/or near Tibet, the Indo-Iranic Sassanians were influenced by semitic priests and magi, and the Ashina clans are known, like in the famous historical case of the Jewish state of Khazaria to have ruled Khazaria and to have converted to Judaism. The Khazaria early historical state has a structure that has close affinities in the kurgan rule of the Kofun Period. The mythical traditions of the royal and shrine histories of Japan, you will find, are closest to the Indo-Iranic as well as the Xiongnu(Hun tribe from whom the Ashina clan descended)-and-Mongolic traditions. All the salt and fire purification rituals and betyl-like Shinto shrines also stem from the Kurgan-CAS influx-era onwards. And one more thing, I think the complete absence of Y-DNA R1a or R1b and J haplogroups in the Ainu or in any of the Japanese people, is the biggest reason why it is hard to see the Ainu as having descended from the Cushitic peoples. We have however, only addressed the Y-chromosomes, it is entirely possible that the early Ainu ancestors intermarried with women already living on the Japanese islands, who were predominantly of the mtDNA M7 and other North Asian lineages, and these may have had remote E. African ancestry, but that is a different maternal trail. The term “Jews” (people of Judah) dates to the Babylonian Exile around 598-538 BC. The term “Semitic” is misleading also, as the descendants of Shem, Ham and Japheth intermarried. The descendants of Japheth are found in Hungary, Turkey, Pakistan, Mongolia and the Upper Nile. This explains the linguistic similarity between some Afro-Asiatic names and some Turkish, Pashtun and Mongolian names, including Jochi, Beri, Malik and Khan. Khan was originally a title meaning king. Today it is a common surname in Turkey, Afghanistan, Pakistan, India and Mongolia. It is equivalent to the Afro-Asiatic Kain or Kayan. Some of the Pashtun tribes adopted Malik as the ruler’s title instead of Khan. Malik is equivalent to the Afro-Asiatic Melek, meaning king or ruler. Genghis Khan married a woman of the Olkut’Hun, or Ogur Hun meaning the Hun clan/community. The word ogur means clan/community and appears to be equivalent to the Pashto orkut, meaning community. So ogur, orkut and olkut are cognates and likely related to the Kandahar dialect, which has Tir-hari as a principal dialect. Tir is a form of the name Tiras, mentioned in Genesis 10 and hari is a form of the word for Horite (Horim). So Genghis Khan married into a community which had connections to Abraham’s Horite people, probably through the ruler Nimrod. In the Hungarian origin stories, Nimrod had two sons: Magor and Hunor. Magor is the equivalent of the Afro-Asiatic name Magog and the Hungarian word Magyar. Magyar is what the Hungarian people call themselves. Some Magyar still live in the Upper Nile area where they are called the Magyar-ab, meaning the Magyar tribe. It is not accurate to speak not of Nigeria or Kush, since these terms are relatively recent . They cannot be used to describe the movement of the Ainu out of Africa. I prefer to use the term Proto-Saharans. I am not disputing this entire section of the history of the expansion of the Hun lineages that you have described, but it is irrelevant and not part of the Ainu people’s history or the Jomon proto-Ainus. The timing of the Jewish diaspora as you pointed out after the turn of the Christian era, is the key point here, which distinguishes the Ainu lineages from the out-of-Egypt or Nilotic Cush (which was originally your geographic term of reference) or Proto-Saharan lineages that descended upon Japan around this time frame. Ainu DE* and YAP gene carriers come from West Africa beginning with the Yoruba tribes in Nigeria. I speak of Nigeria as a geographical region to refer specifically to the place from which the people tested with DE* haplogroup originate. Since my selected evidence is genetic marker-related, Nigeria (as well as Guinea Bissau) in West Africa is not a vague term of my own concoction but a location referred to in the chart map found and identified as the earliest point of the DE* trail in the scientific paper earlier linked for you. The specific genetic trail does not lead through the Nile Egypt, but through Palestine, and Arab Mesopotamian areas where Semitic peoples are also to be found, but the DE* is found markedly in very specific populations all related to proto-Shia pre-Islamic populations, there are highly clarified maps for haplogroup D-YAP populations, so we can see how they lead to Ainu lineages in Japan. The Out of the East Africa-Nile trail is a completely different lineage that leads to the peopling of the Siberians-North East Asians, the kurgan peoples, but all the genetic studies are clear that the dual populations of Ainu and mainland Japanese have completely different sets of mutually exclusive genes in early prehistoric times, with D admixing gradually into all of Japan from the Yayoi-Kofun periods onwards, but with none of the O haplogroups entering the Ainu group. Not only are the time frames for the different in-migrating lineages of Ainu and other Japanese peoples different, their genetic makeup as well as migratory paths are also completely different, as are their oral traditions and myth sets. All of the Kojiki references you made as well as the khan and kurgan structures, attach to the lineages that imposed themselves as elites upon the earlier existing peoples (i.e. Paleolithic-to-Jomon=proto-Ainu). The Kojiki and Nihongi are chronicles by the royal clans, and the myths parallel most of them in the Central Asian or Vedic-Aryan or Sassanid as well as Chinese-Korean traditions, but they are markedly different from those found in the Ainu Yukar oral traditions, and even in the oral traditions, the Ainu speak of themselves as being there long before the children of the sun came on the scene. The royal myths in fact contain mention of the Ainu people in subordinate roles as openers of mountains and coopted guides, and sometimes as subjugated people in battles fought. Your trail following similar-sounding names may work as a theory in combination with anthropological and archaeological evidence for the Mesopotamian-Scythian-kurgan expansion phases, but the further back you go in prehistoric time, the harder it becomes to link the Ainu specifically to the Proto-Saharans or the Nile area, and the more gaps there are all round since it is all circumstantial. You must be aware that there are other Out-of-Africa paths taken like the Horn of Africa or across the Levantine corridor. Skull elongation or trepanation has been a visible trait of all the peoples you connect from Egypt to the Turks and Mongols to Koreans to Native Amerindians, but is lacking in prehistoric skulls of the Jomon or Ainu people. The Ainu also lack all of the Mosaic/Abrahamic traditions, no law set in stone or steles, no writing, no ark, no salt rituals, no ram or horse sacrificial practices, only the bear deification ceremonies which come from the Siberian circum-pacific fishing peoples. That the Ainu(and proto-Ainu-Jomon) vs. other Japanese populations came from entirely distinct migratory lineages is universally accepted by all scholarship within and without Japan. The Negritic Ainu do not fit in any of the Ham, Shem and certainly share nothing in common with any of the Japhetite-Gomer-Magog, etc- groups And most prominently of all, is that the Ainu lack the R1 genes that are found in all of the peoples and places you have mentioned, the Turks, the Huns, the Hungarians … the only likely explanation is the Ainu left from a different origin in Africa, and arrived before all of the aforementioned Mosaic/Abrahamic groups. “The only likely explanation is the Ainu left from a different origin in Africa, and arrived before all of the aforementioned Mosaic/Abrahamic groups.” — I agree, and that is what the evidence of anthropology, molecular genetics, linguistics, archaeology, climate studies, and migration studies seems to indicate. “The earliest figurine-making tradition is thought to have originated from Upper Palaeolithic figurines from Eurasia and Siberia. The figurine developed into the mother goddess figure in the North Pacific area. Originating from the Lake Baikal area, was the ancestral mother goddess figurine figurine. That figurine probably influenced the development of the Amur River and Japanese types. that is just amazing diffusionists drivel. we can state nothing about the meaning of figurines. and “snake motif” is very widely spread over the world. Really dumb. The highest population of haplogroup y-chromosome D are in the Japanese islands and Andaman islands. This is consistent with a coastal migration out of Africa around Southeast Asia How did the scant traces of Group D end up in Siberia and Tibet? Follow the coast until it is too darn cold and turn left at the Amur river or flee the Toba event by going north on the Mekong River. The person who wrote this article have obviously never gone camping and run out of supplies. You need fresh water and food which is easy to catch or pick off the ground and furthermore small sticks and rocks don’t work too good against wolves, bears and tigers nor hunting for game in the jungle, forest or steppes. It would be another 10,000 years before advanced hunting weapons allowed humans to even venture into the deep interiors of Asia. I am sorry that this in depth study avoided the most common knowledge of paleo-geography that is: the continental shelf of the East China Sea was exposed (dry-land) for 100,000 years prior to 16,000 years ago, while the gradual flooding of this 1 million square kilometers took another 10,000 years. In short, after out of Africa, haplogroups M, N, and C populated this immense land that had land-bridges with Korea and Siberian Far East. The distance between this land and Okinawa and Ryukyu Archipelago was in the range of 100-150 km. Climatologically has been proved that this exposed continental shelf had offered much better climate conditions that mainland China-Korea (which were divided only by a Yellow River estuary), otherwise being a single landmass. The coniferous forests and savanna-parks inhabited all paleo-coast, recifes were growing on the southern Ryukyu shores. The fact that the first inhabitants of Japan came there only 35,000 years ago, and only in Ryukyu Archipelago, indicates that the rest of Japan (north of Kyushu) was not exactly inhabited for some unknown reasons (probably connected with climate). In the meantime, Siberia, east of Baikal was inhabited since 45,000 years ago. The evidence shows that a catastrophic volcanic eruption contributed to the depopulation of Kyushu and Ryukyu from 28,000 years ago until 24,000 years ago. The above study did not show the genetic markers before and after the volcanic eruption; eventually, the new inhabitants, settling 24,000 years ago were the Jomon, but the previous inhabitants almost certainly were from the continental shelf of today East China Sea because no crossing from Siberia or Korea into Japanese Archipelago occurred before this time. The Last Glacial Maximum was probably the reason that made some people from Korea to find refuge in Kyushu and Ryukyu 24,000 years ago. In conclusion, the study reveal a bias, and avoid a comprehensive enough analysis . Sources for your said study?